Root-Drench (formerly Root-Zone) protects plants by boosting ABA production. 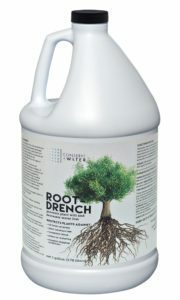 Root-Drench (formerly branded as Root-Zone) is a plant protector product administered as a water-conservation soil drench that stimulates the plant’s own production of abscisic acid (ABA). Why is this needed? Unlike animals, plants cannot take shelter from harmful conditions such as drought, freezing or exposure to salt (water or salinated soil). Either plants adapt to such conditions, or they perish. Under normal conditions, plants lose up to 90% of the water they absorb through transpiration (water loss) as water escapes through their stomata (leaf pores). Extreme temperatures or salt stress the plants by pushing transpiration beyond their limits, causing the plants to wither and die. Fortunately, plants contain a natural hormone, abscisic acid or ABA, that helps plants adapt to dehydrating conditions by closing their stomata to reduce transpiration. Water-efficiency products like Root-Drench (or Root-Zone) can cut irrigation costs by up to 40% and produce additional savings by reducing the amount of irrigation labor required. 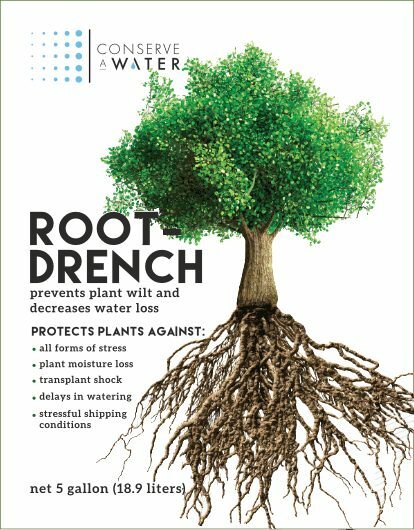 A completely new type of water-saving antitranspirant, Root-Drench is applied with irrigation water to the root system. Rather than closing leaf openings (stomata) with a film like other antitranspirants, Root-Drench is a humectant that stimulates the additional production of the plant’s own ABA to close stomata and cut transpiration through the natural biological process described above. ABA signaling can even help protect cells from damage in seeds! In a drought, when conserving water is critical. Under other extreme weather conditions that cause transpiration stress. Whenever appearance and hardiness must be maintained. Before transplanting, storing, shipping or displaying containerized plants. When there are areas that are difficult to water. Golf Course & Turf Grass Professionals: By decreasing the need for irrigation, mowing and labor, Root-Drench can cut costs by up to 40%. Grounds Maintenance (athletic fields, commercial landscaped areas, highway medians, etc. ): Can cut watering frequency in half. Landscapers: Can double your transplanting success rate! Growers & Nurseries: Before transplanting, shipping or display. Cuts the need for watering AND improves shelf life and appearance. Interior Plants Maintenance: Can double the time between watering. Homeowners/Gardeners (for lawns, landscaped areas): Conserves water and protects plants during drought, heat wave or frost. In a university test, after treatment with Root-Drench, Palmer rye (a sunny grass) and Red Fescue (a shady grass) were not watered for 20 days. Yet the grass remained green and turgid. Meanwhile, a control area, untreated with Root-Drench, turned brown. Tests on many other grasses (using the Root-Zone name) produced similar results. By decreasing the need for irrigation, mowing and labor, Root-Drench can cut costs by up to 40%. Because Root-Drench makes it possible to decrease watering, it also protects grass from mold and disease. This is because grass, by its nature, must ordinarily be given more water than it can effectively use, making mold and disease more likely. Root-Drench decreases that likelihood. Classified as a GRAS material, Root-Drench won’t contaminate groundwater since it contains no nitrates, phosphates or petrochemicals. Root-Drench protects grass from the stress of digging, shipping and sod re-establishment. Water thoroughly turf 24 hours before applying Root-Drench. Then drench the turf with normal irrigation methods and, for better results, do it while the turf is wet. To start, mix Root-Drench at the rate of 6 oz. per gallon of water. Then apply solution at a rate of 2-3 gallons per 1,000 square feet and achieve a full root drench. After Root-Drench is applied, water the turf lightly to help carry the solution into the primary root area. Doing so will not only produce the best results, but it will also eliminate surface residue and clean your application system. “Here at Vecchio Trees we specialize in specimen trees for landscape purposes. Through our process we have incorporated the use of Root-Drench (Root-Zone) and Moisture-Loc into our regular routine. These products are used on deciduous, brood leaf, and evergreen trees for transplant and transportation, and all have had 100% success. Our company often ships trees into Texas and Florida, which can be 5-7 days without water on a truck through different climates. With the use of this product, the trees arrive on-site to our customers in great condition and no dryness. At tradeshows our product is featured in an enclosed building and left without water for multiple days. By applying this product before we ship, our trees are showcased beautifully with no leaf drop and/or discoloration the entire time. We have harvested Quercus Lobatas (oak trees) in 100 degree temperature and applied this product and then shipped to our customer 90 days later. We had no leaf shatter or shock as a result from the product usage. At Vecchio Trees, we have encouraged our clients to continue using Root-Drench and Moisture-Loc once it has arrived on-site. Our belief and success in this product has allowed us to further our business. Looking for the Root-Drench SDS (Safety Data Sheet) or Label?